Update: On Tuesday November 4 North Dakota voters rejected Measure 5 with a resounding 79.4 percent voting against the Clean Water, Wildlife and Parks Amendment. Oil prices on Tuesday slumped to a three-year low, slashing profits of energy companies operating in the Bakken. Locals call it the “oil patch.” With the magic of advanced hydrofracking technology and oil prices above $60/bl, the Bakken oil field in western North Dakota has put dusty, declining prairie towns like Williston “on the map” in a big hurry. Domestic U.S. oil production has surged since 2009 as North Dakota becomes the second largest U.S. producer behind Texas (and surpassing Alaska). But it’s all happening so fast. To an outsider, the impact of this new oil boom on the people that farm, hunt, fish and make a life on the northern prairie is barely noticed. It’s a different story for North Dakotans, the folks that have called the state home since before oil came to town. They all have a stake in how their state is transformed by the latest Big Oil Rush, as it inevitably will be and already is. “I said I was just going to coast into retirement, and then all hell broke loose,” says Walt Peterson, the Williston district engineer for the highway department, in a New York Times article. At first blush the economic benefit of the oil rush seems readily apparent. The Bureau of Labor Statistics ranks North Dakota with the lowest unemployment rate in the country, a mere 2.8 percent for September, 2014. Battling against an exodus of young people in search of more lucrative options and declining tax bases, many prairie towns in northwestern North Dakota sorely need an economic boost. They’ve got one. But towns like Williston have seen the cycle of boom and bust before. Forty years ago it was coal and as quickly as the boom came, it vanished, All the newcomers left, leaving towns with the tab for infrastructure and services that suddenly nobody needed. But some people say it’s different this time. The changes in North Dakota from the Bakken play, counted among the world’s largest oil fields, are now visible from space. As construction of “gathering pipes” and other infrastructure for processing, storing and transporting the recovered “tight oil” struggles to keep up with production, up to a third of the natural gas that comes up with the oil must be flared off. 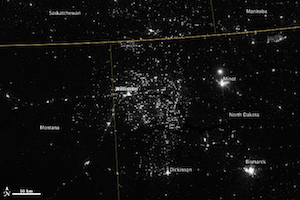 Nighttime satellite images show the Bakken shining as brightly as many major urban centers like Minneapolis or Chicago. Though only one to two percent of it is recoverable even with modern fracking technology, estimates run as high as 24 billion barrels barrels of extractable oil from the Bakken, a boom that could last up to 20 years. But at what cost? And, even if it the play does last 20 years (of which there is no guarantee) then what happens? Long gone are the days when an oil prospector could poke a stick in the ground and unleash an unstoppable gush of oil. The idea that exploiting shale and tight oil formations will create a new “Saudi America” is a myth. “Oil production technology is giving us ever more expensive oil with ever diminishing returns for the ever increasing effort that needs to be invested,” writes Raymond Pierrehumbert in Slate. It’s a “Red Queens race” of running faster and faster just to keep up. Statistics presented at a meeting of the American Geophysical Union show that as of 2012 it took 25,000 new wells per year, at a cost of about $10 million each, just to keep up with 2000 production levels, when only 5,000 new wells were dug. 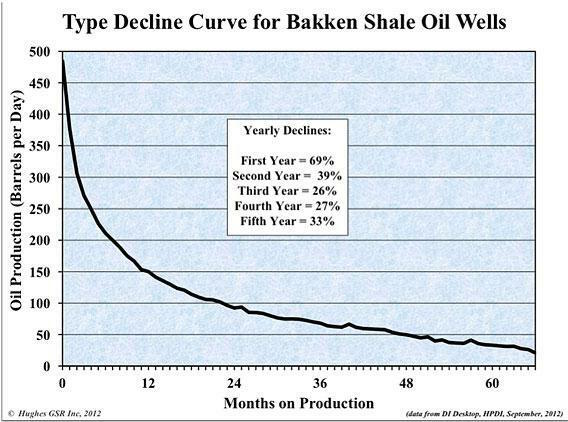 Even if they start out as high-producing wells, they dry up rapidly, as this graph from J. David Hughes, a geophysicist and member of the AGU, shows. Once a boom starts, the die is cast, but can it be controlled and managed? Can long term costs be weighed against short term benefits? As development pushes up against Theodore Roosevelt National Park, thousands of barrels of crude oil are spilled in fiery rail crashes and hundreds of “incidents” go unreported, with the risk of more constantly on the rise, the time has come for the sparse but spartan population of longtime North Dakota residents to assess the real cost of the Bakken oil boom on their state and their way of life. On the state ballot on Tuesday is the North Dakota Clean Water, Wildlife and Parks Amendment, or Measure 5, a locally controversial proposal to set aside 5 percent of the revenue generated from oil extraction for conservation. If passed, the amendment will direct 90 percent of the money raised into a Clean Water, Wildlife, and Parks Fund and 10 percent in a Clean Water, Wildlife, and Parks Trust. The fund will be used for grants to public and private agencies to support efforts to improve water quality, fish and wildlife habitat, natural flood control, land acquisition for parks and outdoor recreation, access for hunting and fishing, and outdoor education for children. Every three years a Citizen Accountability Board will be appointed to review grant applications and make recommendations to the Clean Water, Wildlife, and Parks Commission, comprised of the governor, attorney general and agriculture commissioner. Measure 5 can’t address all of the impacts from the Bakken Boom, the social problems, lack of housing and infrastructure. 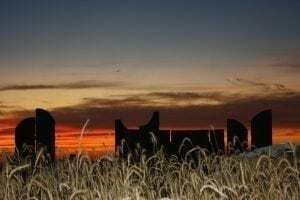 But it represents an opportunity to restore and protect some of the heritage that most North Dakotans value – their land and their natural resources. Adair added that measure 5’s authors worked closely with the fossil industry to address their concerns. None of the money going into the fund or trust can be used for litigation against oil producers or for environmental lobbying. Nonetheless anti-5 rhetoric speaks of the creation of a radical environmental agenda. “This is a phony deal that is promoted by Ducks Unlimited, Pheasants Forever and other environmental interests and extremists. It will not improve hunting in North Dakota and will only build an environmentalist-controlled EMPIRE for at least 25 years,” spouted one op-ed in the Grand Forks Herald. But talk of “environmental extremists” aside, there is another voice in North Dakota. One that speaks more directly to the issues and how measure 5 will address them. “Measure 5 also could mean the difference between maintaining our world-class habitat and wildlife or watching our hunting heritage disappear. Our neighbors in Iowa and Minnesota have shown us what happens to wildlife and recreation when the habitat is gone. Let’s not repeat their mistakes. Sitting in a family diner on the southwestern edge of Jamestown, North Dakota, I recently had an opportunity one blustery autumn evening to talk with two brothers, lifelong residents of Jamestown, about Measure 5. One brother does road maintenance for the city and the other is a social services worker. The brothers had differing political views, one conservative, the other more liberal. But they both shared a lifelong passion for the outdoors. For hunting and fishing, for the wide open land of their home. I dare say neither one, not even the left-leaning brother, has any desire to appoint a radical “environmentalist-controlled empire.” But just like every other resident I spoke with on my trip, they are concerned about what’s happening to their state. Sure, North Dakota’s coffers are bursting, but many feel the consequences of the latest oil boom aren’t being adequately addressed. Measure 5 is an attempt to preserve the natural and agricultural heritage that these two brothers, and many others like them, hold dear. To make sure “development run amok” doesn’t devastate their way of life. The question that faces North Dakota voters on Tuesday is a question for all of us. At what cost do we endlessly pursue every last drop of fossil energy, each drop more expensive and fleeting than the last, and finally face the realization that it is ultimately a losing proposition?